Given the success with the oil cloth hat, I wanted to give a go with a jacket to see if I could reclaim some of the satisfaction of using the lost Browning. I found a jacket at Cabela's a which has nice lines and a lot of pockets for urban cargo. 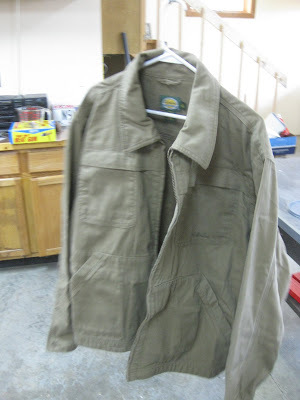 This jacket is made from a medium-weight tightly-woven 100% cotton canvas. Cabela's describe the it as a 16-Penny Carpenter Jacket. It was on sale for about $25, a price that I deemed reasonable for experimentation. Because of the amount of the fabric, I modified the oilcloth recipe adjusted for lessons learned with the hat project. After reading additional posts by Bob Smalser, I decided to take the safe route and use a double boiler. The following recipe and yields about 3/4 of a gallon of solution. This is the recipe I used. I recommend some changes and have documented those in the text below under "What I learned." All of this stuff is very flammable and it needs to be heated so take the necessary precautions. Oily rags will spontaneously ignite if not disposed of properly so take the necessary precautions. Get a one gallon metal container. Shave the bees wax into small pieces. 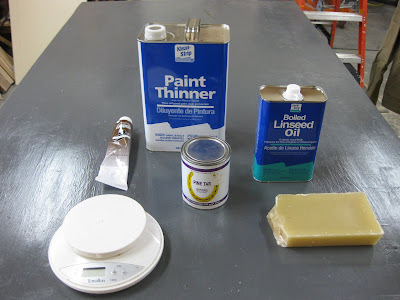 Combine the linseed oil, bees wax, pine tar and paint. Heat ingredients until completely dissolved. Remove the container from the boiler. Dilute the mixture by stirring in the mineral spirits. Pour the mixture into a plastic storage container measuring about 18" x 24". Dunk move the jacket to ensure that the solution flows into all parts including double pockets and any under collar corduroy. Place the jacket on a hanger and let it drip into the storage box. Use a heat gun to move the solution around if necessary. This is useful at the cuffs and the bottom edge of the jacket where the solution will tend to accumulate as the wax dries. Let the jacket dry for several days outside during warm weather. With the hat process, I cooled the solution but with the double boiler I don't think it is necessary since the maximum temperature of the solution is constrained by the boiling temperature of water at about 220 degrees F. I felt that the solution was too thick. If I had it over, I would double the quantity of mineral spirits bringing the quantity to a full gallon. This would have helped both the penetration and draining process. However, it might have decreased the stained power of the paint; I am not sure. However, because of the density of the solution and the amount of fabric, it was necessary to use the heat gun at a higher temperature (potentially making char cloth) and the wax wouldn't flow completely down the fabric. Eventually, it was necessary to use an iron and a couple of rolls of paper towelling to extract the excessive solution from the heavier parts of the jacket. This worked pretty well and should probably be part of the instructions. If you try this, let me know how it works. Feel free to post any modifications to the recipe. 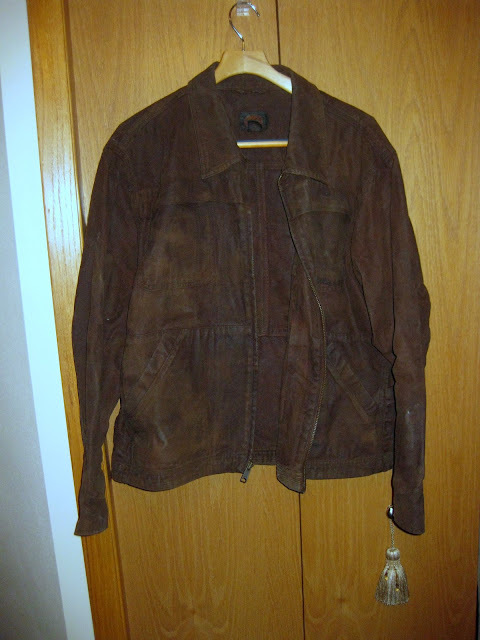 This is the jacket as of December 2009. The color turned out perfectly but the jacket is still a bit stiff. However, it has a rich "leathery" texture that will wear forever. I wore it in a full day of pouring rain during the Apple Fest in Bayfield Wisconsin during the first weekend in October along with the oilcloth hat. I was perfectly dry the entire time despite the blustery weather. A thin sweater under the jacket was all that would needed to keep the chill out. If I redid the project, I would use slightly less bees wax and slightly more mineral spirits to break the stiffness of the final fabric. After I finished the jacket, I had some ingredients left over but a limited amount of paint. I tin clothed a duffel bag and the consistency of the material was perfect although it lacked the deep brown color. Finally, I have received two emails about the oil cloth project: both were positive. In one case, the person was making backpacks....a perfect application. In the second case, the person made a "pirate" coat and sent a picture. It was a remarkable job. Thank you both for your feedback.